I have always thought of myself as a very rational person. Frankly, I have been quite proud of that trait. It did me a lot of good in a world where IQ and hard skills is essential for growth. When asked to describe myself, I would say I was a left-brained guy. I got interested in human behavior and mindset early on during my MBA days. I learnt that along with analytical intelligence was a need to develop something called Emotional Intelligence. But I had trouble embracing that idea. Being rational, I told myself that emotions should be kept aside as much as possible as it would only interfere with sound decision-making and ability to convince others. In other words, emotions always remained something of secondary importance to me. Then one interesting thing happened. For one of my job interviews, I underwent a pretty intensive leadership competency assessment which was required by the company for high potential hires. One of the exercises was a case-study – long and detailed and included multiple dimensions. I had to analyze the case-study and arrive at a certain decision. Then I had to do a role play wherein I was a manager and I had to convince my boss (the assessor) on why we should go ahead with the decision. At the end of the role-play, this is what my assessor had to say “Suman, you did an excellent job in analysing the situation but I am not convinced because the energy was missing”. Energy, what energy? Listen to my facts! I started pondering over his response over and over again in the days and months ahead. Eventually, it left a profound impact on me and helped me finally understand this thing called EQ! We all have a rational side and an emotional side. How much is the rational part and how much is the emotional part? What is the ideal mix? Does the ratio vary depending on the situation? Is it ok to display emotions? It is not only ok but absolutely essential to bring out emotions in our interactions. Human interactions are based on emotional connection. To make conversation, we first have to make a connection. It is like dialling someone on your cellphone. You first dial (connect) and then speak. If the line drops, you redial and reconnect. The same is true of real engagement – we need to check if we are emotionally connected before exchanging information. If that connection drops, we would be talking without the other side listening! The ability to think is what makes humans unique in the animal kingdom. We have a thinking brain also known as the executive centre. In terms of evolution, this part is relatively new. The Emotional brain triggers first. Hence, we first feel and then think. And often, our response or behaviour is determined by how we feel even before our executive centre has processed the information! If the feelings are negative, it can hijack the thinking part. This is why we are often more emotion-driven rather than logic- driven. This has huge implications for leadership. For one, we need to be cautious of not just what we say but how we say it. In case how I say something brings in negative feelings in the other person, it could shut down their thinking and make them defensive and not open to my suggestions or feedback. The emotional connection would have broken! Are you taking responsibility for your actions? For a lot of people, things happen to them. They feel that most things are beyond their control. They refuse to acknowledge responsibility for their lives and blame other people for their problems. On the other hand, there are some people who make things happen. They believe they can determine their future. A simple concept called Locus of Control nicely brings out this difference. Let’s say Rajesh has an exam and starts from his house in the morning in his two-wheeler. He is a bit tense about the exam and is therefore absent-minded while riding. He jumps a red light and gets stopped and ticketed by a policeman. His exam does not go too well as he is mentally disturbed. Moreover, his strategy of selective studying backfires as more questions come from the chapters he skipped! Rajesh comes home and starts thinking back on his day. “The cops don’t catch the ‘real’ culprits” he thinks. They pick on two-wheelers like us instead of catching the bigger culprits such as buses and autos. “It was a tough paper” he decides. “The teacher didn’t warn us!” referring to the chapters he skipped during selective study. And finally he concludes that he is plain unlucky. Let’s say Rajesh’s friend Sudhir also has an exactly similar experience that day where he too gets caught by a cop and also fares badly in this exam. However, Sudhir’s reactions are quite different. “I messed up” he tells himself referring to his lack of adequate preparation for the exam. He vows to do better next time. “I need to be more careful when riding” he ponders realizing how dangerous it can be to jump lights especially if one is absent-minded. It’s interesting to note how the same scenario results in totally opposite reactions depending on attitude and where the locus of control resides. For Rajesh, he has more external locus of control and does not take responsibility for this actions. He blames the cop, his teacher and the tough paper for his bad luck. On the other hand, Sudhir has an internal locus of control and is ready to take responsibility for his actions. And because he does so, he is able to make changes and improve his performance next time. We often hear statements which clearly point towards an external locus. “I got it from my parents” (don’t tell me to change! ); “Yes, I have a short fuse (don’t tell me to keep calm! ); "The economy is bad” (don’t blame me for not meeting my numbers!) – the list is long. So next time you justify something to someone or even to yourself, ask yourself whether you are taking responsibility for your actions and displaying more internal locus of control. If you want to assess your locus of control, take the test here. Train them and they will leave! Recently, we approached an organization to explore the possibility of partnering with them for training. We were told that they do not believe in training! “They will leave if we train them” they said. Without much ado, we came back and scratched that company’s name off our list of potential customers. However, this incident got me thinking – how prevalent is this mind-set? 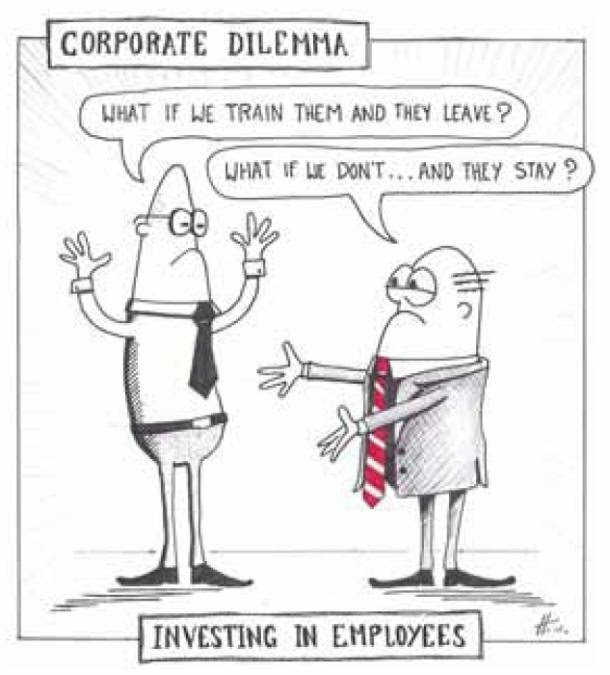 The best response to this question is summed up in the cartoon below – someone asks this question to the CEO “What if we train them and they leave?” The CEO responds “What if we don’t…and they stay?” Simple to the point of being funny but very profound. Why do people leave? There is a saying – “People join organizations and leave bosses”. It ultimately boils down to a simple thing – how are people treated in the organization? Sir Richard Branson puts it very nicely “Train people well enough so they can leave, treat them well enough so they don't want to”. So while training does increase employability, no one leaves a company because they got trained. If we ask an organization “Do you need to build capabilities?” the answer would invariably be yes. In a recent McKinsey Quarterly survey, 90% of respondents said that building capabilities was a top-ten priority for their organizations. Aren’t building capabilities and training people two sides of the same coin? So the same question posed a bit differently has an obvious answer. Probably, it has to do with the proverbial conflict of us vs. them – Sure, ‘we’ need capabilities but ‘they’ getting trained? Not so sure. Companies employ different techniques to recover their investments on training. For example, a company might require team members to reimburse for the cost of the training should they leave before a specified period of time. These often run into enforceability issues from a legal perspective. Also, it is not very clear how effective such actions are. Some CXOs argue that that they would like rather lose the training cost than to have someone stay at the company just because he/she does not want to pay for the training. Sometime, a gentleman’s agreement and a handshake works better than formal papers. The other interesting thing is to see who the people who leave are and what impact does training have on them? All organizations complain that the good guys seem to leave. This is universal. These ‘good’ guys are willing to invest in themselves even If their organization is not. As a people manager, I have had a lot of team members approach me to see if the organization would reimburse for their training. The good guys often did that ‘after-the-fact’ – having undergone the training and not let the reimbursement policy be the deciding factor whether to undergo training. So for a company that does not train – it would still lose their best people and be left with folks who are often unable to get better prospects outside. And then keeping those folks untrained can become a scary thought! The cost of not training is far more than any training investment done by companies. While it may seem counter intuitive, training actually builds team members’ loyalty. Team members are more committed to their organizations that show commitment to their people by providing them with training. In my career I have observed that when I received a feedback and took it in the right spirit and worked on it, I had significant gains in terms of realizing my potential. To build a cohesive team where the team members understand the strengths and weaknesses of each other and work on complementing each other to achieve a common goal, the stream of feedback needs to be uninterrupted. The role of the team leader needs to be that of a moderator who ensures the feedback flow does not become a stream of negative emotions against each other within the team. 1) The fear that the feedback will adversely impact their performance evaluation; this prevents team members who are otherwise close to each other to give honest feedback about one another. And there is no one better qualified to give feedback than somebody who is close to us. 2) The fear of retaliation by the feedback receiver. 1) Encouraging feedback flow and building an environment that is safe for the employees to provide feedback on anyone including the team leader. 2) By working with each team members on building a development plan for the team member, based on the feedback received. 3) Building trust within the team that the status of the development plan will form the basis of the year-end evaluation and not every feedback that comes on an ongoing basis. 4) Weeding out feedback that are not constructive. 5) By closing the loop with the feedback provider. For example, if the feedback provided is not being acted upon, then the leader can go back to the feedback provider and explain that there are other priorities that the feedback receiver need to work on right now and he/she will work on the given feedback later. For a team that has trust issues within the team members or a team that has formed an anti-feedback culture over a period of time, implementing the above practices can be a significant challenge. The team may need an external facilitator to form the correct norms within the team. The external facilitator can start with a well-designed workshop to get the team warmed up to the idea of giving and receiving feedback and subsequently work with the team leader for an extended period to fine-tune the feedback mechanism and maximize effectiveness.